Last week I bought a Sony Reader PRS-650, which Sony would like you to call the ‘Touch’ and I like to think of as my personal remote Scottish beach. Sony’s eReader devices are currently locked in competition with the Amazon Kindle, a wonderful creation with wifi and 3G Internet connectivity, and the ability to buy books direct from Amazon without connecting to a host computer. The Sony has none of these things, and currently costs £70 more, if you want an equivalent six-inch screen. So why did I buy the Sony? These two devices are both excellent, so it wasn’t an easy decision. This is my first eReader with a reflective, e-ink screen, but for two years now I have been reading books on my iPod Touch, and before that on a Palm PDA (actually a Sony Clie running the Palm OS). I had reached a point where I wanted to spend more time reading eBooks, but the iPod’s small screen was holding me back. Past generations of the e-ink screen technology never seemed good enough to me, but reviews of the Kindle, and the little time I spent with the Sony in Waterstones, convinced me that things have changed. The new screens refresh quickly, and they are sharp, and clear. It was time for an upgrade. I like the look of the Kindle 3. Apparently it has a great screen, and the wifi seemed, at first, to be a killer feature. Why would you not want to have some access to the Internet, after all? But there are plenty of ways in which the Kindle doesn’t suit me. For one thing, the Kindle is designed, first and foremost, to drive sales from the Amazon Kindle store. And just as in the early days of iPods and iTunes, Amazon sees fit to encumber its books with copy prevention software (DRM) that stops them being read on other devices. Certainly you can put books in other file formats on the Kindle, but crucially, so far, not the open ePub format (with and without DRM) used by all the other eReaders. I’ve come to the conclusion that the Kindle and the Sony Reader are doing different things, and addressing different markets. Perhaps they are not really competing at all. The Kindle has the Amazon store all sewn up, so if you want easy access to recent books, and don’t mind about the DRM locking you and your ebooks into an alliance with Amazon forever, that’s the one you should go for. It’s convenient, it’s slick: it’s an iPod for books. What Sony is doing is slightly different. Sony is a hardware company, so while it would prefer customers to buy ebooks from the Sony store, ultimately what it wants is for people to buy Sony devices. Sony doesn’t really care where you get your books from as long as you read them on a Sony Reader. Perhaps because of this, Sony has added features that apply more to documents in general, not just books. The Reader comes with a stylus, so you can write freehand on documents like meeting agendas, or in the margins of books. You could draw a diagram, or a map, or play noughts and crosses, or hangman, with your kids. Chess and Backgammon would work well too (you listening, Sony?). If you prefer to type there is a decent on-screen keyboard, though it is a little slow, and the touch screen allows you to highlight text with your finger, or swipe to turn pages. I’ll be using it mainly for reading out of copyright public domain books. In some cases these are the kinds of books you don’t get to take out of libraries because they are too valuable. In the past I might have had to travel to read them, but Google has brought the archive to my couch. I’ll be reading other things too: books from Feedbooks and Project Gutenberg, and I may even buy some modern ebooks. I dislike the idea of DRM, but I can see two cases where I might not care about it so much: throwaway, read it once paperbacks, and technical manuals that will go out of date quickly. Anything I might want to keep for a while, and might want to read again, I’ll buy in an open format, such as a physical book. If you buy a book, or download music, that is encumbered with DRM, you have to see the transaction as a loan. And speaking of loans, the Sony Reader allows you to borrow ebooks from a large number of public libraries, including the one here in Liverpool. The Sony Reader has different features from the Kindle, and in some ways is it less convenient and less slick. As a piece of hardware it is beautifully designed. It is solid, and nice to hold; the touch screen is very good indeed. What clinched the deal for me though, was the lack of wifi or 3G. One of the things I love about physical books is the lack of distraction. Books offer a glorious absence of any possibility of reading a blog, searching Wikipedia, or checking for email. 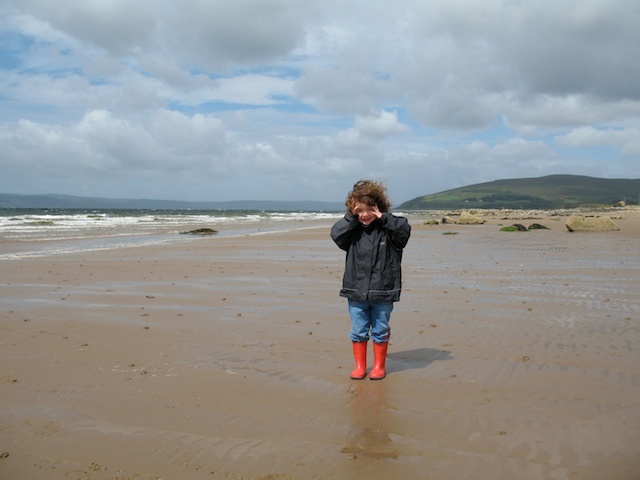 And that brings me back to the remote Scottish beach, one of the few places remaining on Earth where access to the Internet cannot be taken for granted. It feels good to be unhitched from email, and Google, and Twitter once in a while, and my new eReader is going to take me there. Most people are familiar with the industrial method of catching whales in the twenty-first century. In news items and protest video footage we see the giant warship-like vessels, armed with powerful harpoon cannons, dragging in the massive carcasses on chains, and the mechanised butchery that takes place on their decks. But in the 1820s, whaling was a dangerous and inefficient business. Around a hundred ships sailed each year to the Arctic, each with a crew of sixty men, and they pursued whales in small boats, harpooning them by hand. 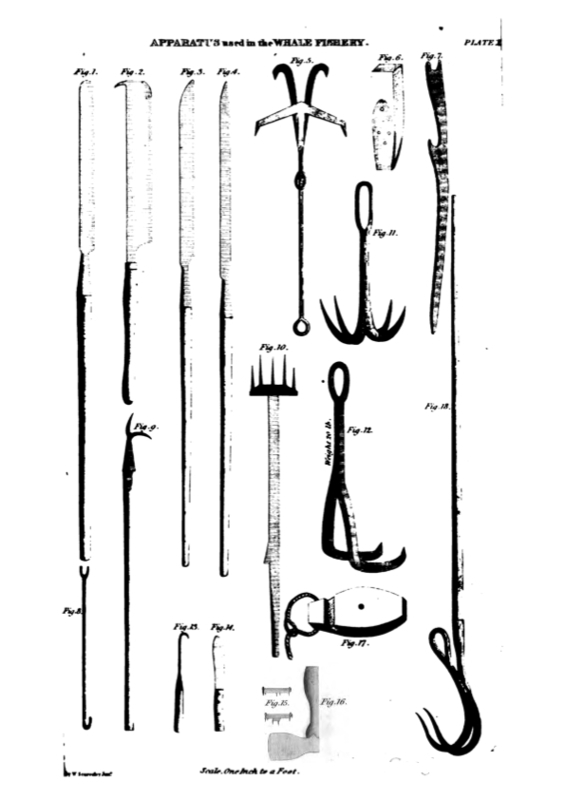 The image above illustrates how close whalers came to their prey: lances for killing the “fish,” flensing knives for removing blubber from the carcass as it floated alongside, grappling hooks, hatchets, and splicing tools for securing and towing the whale. These tools had been developed over two centuries of whaling, and while they had been refined in that time, they would have been recognised, or at least understood, by a whaler from the 1600s. In the 1820s, however, new technology was challenging the work of the most valued members of a whaleship’s crew, the harpooners. Whaleship owners took a rather more practical view of the process of capturing whales. They preferred technology to talismans, and were keen to develop harpoon guns that did not rely on the strength of the harpooner. One of the reasons Manby accompanied Scoresby on the 1821 voyage was to test his design for a harpoon gun (Manby is more famous for his rocket propelled line, used to rescue survivors of shipwrecks). By1820 several attempts had been made to design a gun, some, including rocket-propelled harpoons built by Sir William Congreve, more successful than others. In 1821 several Greenland ships carried harpoon guns or rockets, including the Whitby ship Fame, commanded by Scoresby’s father, which used Congreve rockets, the Trafalgar, of Hull, which had been supplied with Manby’s guns, and the Baffin herself. Naturally, the harpooners were “jealous” of the harpoon gun, fearing their skills would no longer be needed, and Manby had a difficult task in persuading them otherwise. He explains in his journal that his inventions, including shells, to be used in killing the whale from a distance, were intended to improve the efficiency and safety of whaling: “The employment of these last missiles, was, I also stated, desirable on the ground of humanity, by their quickly terminating the misery of the fish, and obviating the necessity of the barbarity often avoidable in the present system”. Manby’s experiments with his harpoon gun and explosive harpoons, were undermined by the crew who refused to use them as instructed. Manby’s explosive harpoon was just one of several similar designs over the following sixty years. The gun which eventually brought about the end of whaling as Scoresby knew it, was designed in the 1860s by a Norwegian, Svend Foyn, whose harpoon gun was fired not from a small boat, but from the prow of a steam-powered whaleship. It was not until the 1880s that Foyn’s gun, and his harpoon with “umbrella” barbs and exploding head, was widely adopted, putting an end to the mystique and “magic” of the traditional harpooner. “Richard Simpkin, you have been selected to the charge and direction of the boat, appointed to try the practical utility of my gun and other apparatus, which are intended to promote and ensure success in the whale-fishery, and to afford assistance, in the time of danger, to those who are prosecuting that service. I only ask for A Fair and Impartial Trial, to judge whether the adaptation of my inventions to their several intentions, will confirm their utility by practical examples of success, (which I expect that the inveteracy of prejudice cannot withstand,) or whether they will require any alteration or improvement to render them effectual. It is now proper for me to state, that you have been selected, as, this being your first voyage in the rank of harpooner, there is less liability of your being influenced by prejudice, or by an obstinate adherence to old customs. I wish you to keep in mind, that my intention is to do an essential public benefit; and in its operation, to obtain advantage to the owners of the ship who give you employment; to your captain who promoted you to the situation of harpooner; to your companions, who are deeply interested in the success of your boat; and lastly, to yourself, not only from the rewards you may acquire from the use of the gun-harpoon, but the credit you will derive in being the first man to establish its utility. –From George Manby’s Journal of a Voyage to Greenland, in the year 1821. I’ve been using a Nokia E72 smartphone for six months now and with the recent release of the new iPhone 4 I have some thoughts on what makes it a great phone and what makes it incredibly annoying. The great things about the E72 are mostly in hardware, though there are a few software features that are pretty compelling. It has a terrific hardware qwerty keyboard, which means you can text while flying a light plane under electricity pylons without taking your eyes off the terrified onlookers. It has excellent battery life measured in days rather than hours and the battery is removable, meaning you can fiddle with the compartment cover at moments of tension, thus dislodging the battery and switching off the phone without realising, so you fail to answer when your wife calls, and she spends an hour standing on a wet railway platform. The 5 megapixel camera produces decent results in good light and it will print over wifi to a networked printer, making it the next best thing to a Polaroid camera on home turf. And no shake and wait either. The OVI Maps turn by turn navigation, which comes free with Nokia smartphones, is superb. This phone has replaced my wife for all navigation-related activities and yet provides sufficient ambiguity to allow for petty and concentration-sapping arguments in heavy traffic and at dangerous junctions. As satnav goes it’s just about perfect. Add to this apps like Joikuspot, which turns the phone into a Mifi-like wifi hotspot, Skype, which can use the front facing camera for some much-needed nasal hair time, and the built-in office software–email, Documents to Go, an app that converts text in images to text in, well, text–and the E72 is a powerful and useful tool. I like this phone a lot. 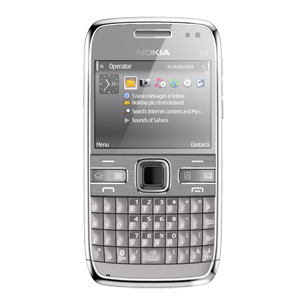 It is powerful, well made, and, running the latest version of the Symbian OS, solid and dependable. It’s not as flexible as the iPhone, and the layers and layers of menus and pages you have to navigate to do anything out of the ordinary remind me horribly of Windows 3.1, but as a communication device it works very well. Texting and emailing are far too easy, and it can make calls and everything. What really lets it down though is the software for sharing the data with a PC, and for installing updates and apps. iTunes comes in for a lot of stick for being bloated, buggy, and restrictive. Even so, iTunes is a smooth highway compared to the ploughed field that is Nokia’s confusing and over complicated Ovisuite. Fortunately I only need that for updating the phone software. With the help of a phone-specific plugin, the Mac’s in-built syncing service, iSync, takes care of calendars and addresses over Bluetooth, while Nokia’s excellent Multimedia Transfer software deals with music, photos and the rest. In December 2008 I wrote a short blog post here suggesting that more by accident than anything else Apple had built a device that was a competitor for the Kindle. Back then Steve Jobs was in denial about the popularity of books so it took applications like Stanza to make reading possible on Apple’s handhelds. It worked, and continues to work, very well. But now the fabled iPad has arrived and it has book reading built in, complete with support for the open ePub format. Of course that pleases those of us who like to read books from Project Gutenberg and Google Books on our iPods, but Apple has done something very strange with the look and feel. Having read books on my iPod Touch for a year and a half now I’ve broken free of the need for pages that look like pages. When I’m reading a book that’s all text, all I need is text. It’s certainly an improvement for books with pictures, but I can’t help thinking Apple’s iBooks look a little cheesy with their flippy-over paper-like pages. For all its power and flexibility, the web is really bad at presenting bounded, holistic work in a focused, immersive way. This is why web shows never worked. The web is bad at containers. The web is bad at frames. What the iPad offers is a frame, and one with well-defined limitations. I’ve been arguing something similar, though less concisely, over at shiftinglandscapeofmagazines. Here is a spur to create new forms of content and perhaps also to persuade people to pay for it. That will please Rupert Murdoch of course, but the real revolution could be for smaller players; it could be a lifeline for struggling literary magazines and a new outlet for authors who want to self-publish and get paid. Writers essentially become app developers. If the iPad doesn’t do it for you, there are lots of alternatives. Edited 29/1/10 because WordPress originally exposed a draft. Probably my fault in some way. I love magazines and I buy more of them now than I ever have. I love the feel of them, the shiny pages and the big glossy images. I like the way good design and good writing work together to create something that feels made or intended. I don’t get those experiences from the Web, though the vast majority of my reading is now done online. Magazines are like an icecream sculpture in a fancy restaurant; the Web, by comparison, is an unstable snowfield on the brink of avalanche. But I have hope. Firstly iPhone apps such as McSweeney’s show what can be done in terms of delivering nicely produced, good-looking content on a small device. McSweeney’s has proper typesetting and feels good to read even given the constraints of a tiny screen. Secondly Apple’s attempt to revive the album through iTunes LP shows what can be done when the constraints of the devices involved can be tightly controlled. Interestingly, given the current hype surrounding ‘content in the cloud’, neither of these examples is truly an ‘online’ experience, since the content is downloaded to a device. The result is that it is tightly controlled and not subject to bandwidth issues. Apple does something similar with its Apple TV, storing content on the device, rather than streaming it on demand across the network like other media players. In terms of magazines the following remarkable video shows what might be possible. Snow Leopard: Why Ship a Physical Disk? The ‘I upgraded to Snow Leopard’ stories are coming thick and fast and for the record this is mine. Here are the facts: It took about 55 minutes and there were two reboots, one half way through and one at the end. That’s it. This was a very easy upgrade with no human intervention beyond a couple of clicks to get it started. Since I have a Time Machine backup and keep my work in progress in on a synced Dropbox volume I didn’t worry about a clean install. It just wasn’t necessary. Snow Leopard seems fine, but what I don’t understand is why I had to wait for the postman to deliver a CD. Why doesn’t Apple deliver OS upgrades like this using iTunes or even the regular Software Update tool? Most Linux systems deliver major upgrades that way using package management tools such as Synaptic and it works very well. The Ubuntu desktop I’m using to type this has had two Snow Leopard-equivalent upgrades now, both delivered in the same way as regular bugfixes and security updates, through Synaptic. If Apple has now caught up with Linux and Mac users no longer need to do clean installs it seems crazy for Apple to keep shipping actual physical media. We don’t buy iPhone OS upgrades on a disk after all. Incidentally since I was installing Snow Leopard on my Mac I took the opportunity to upgrade my wife’s iBook G4 to Leopard. I kept the old Tiger install disk handy in case performance was poor, but actually this six year-old machine runs very well. Of course it will never be able to run Snow Leopard, but it will at least continue to receive updates until Mac OS X 10.7 “Hepcat” renders 10.5 obsolete. By then it will be around nine years old. She’ll have to manage with only 12GB of free disk space though. Manufacturers of electronic gadgets know only too well that small and shiny sells and that bright colours mesmerise the ape brain. Modern electronics and plastics make wondrous things easier to achieve in miniature, but in fact not much is new. Dropping in after a picnic lunch at the rather lovely Angus Folk Museum a couple of weeks back I found this little beauty in a glass case. It’s difficult to appreciate how small this camera is from the picture–since it’s behind glass I couldn’t slip a ten pence piece in alongside it–but that thing just in front of it is a roll of 16mm film, so just over 1.5cm tall. The camera itself is about the size of my thumb. 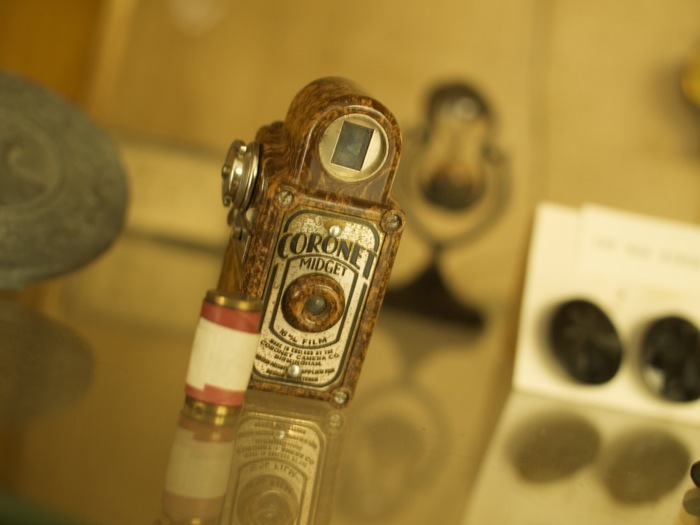 According to this article at ephotozine.com the Coronet Midget was in production from 1935 and was advertised as ‘the world’s smallest camera’. While it’s a long way from that now it is still a lot smaller than most current ‘point and shoot’ cameras. Like many current cameras it also came in a range of colours, including blue, red, and black. The down side of course is that the standard prints that came from the six-exposure film were so small they had to be viewed with an accessory magnifying glass–just one of a range of accessories available apparently. It seems that the Coronet company, which was founded in 1926, ceased production in 1967, but with marketing ideas like these it might have done well today. Picture taking with a Midget was a straightforward affair as there are no camera adjustments available. In fact apart from the shutter release, the only control is a lock to prevent the camera being fired accidentally. The photographer’s only real choice is whether to take the picture in landscape or portrait format. The claimed shutter speed is 1/30 of a second and the lens has an effective aperture of f/10. The Coronet Midget was discussed on the Instructables forum earlier this year and there are some good pictures showing the camera alongside familiar objects, including the obligatory coin. Still more pictures of Coronet Midgets here. I hope those words taste good. The Senate votes on proposals today and given the historic antipathy of the British professoriat to anything that might be seen as making trouble, the likelihood is that the turkeys will vote for Christmas. I hope they prove me wrong. An interesting side issue in this though is related to the way the students have reacted. Feelings are running high and a protest is planned outside the Senate meeting. The way they have organised the protest is, inevitably, through Facebook. Unfortunately, while many students use Facebook, many of their tutors avoid it for the very reason that their students use it. There are already lots of ways students can contact tutors out of hours–email from students is a frequent intrusion on my family weekends, though it generally goes ignored until Monday–and Facebook looks like just another way to remove the boundary between work and private life. This forum thread at the American Chronicle of Higher Education (hat tip to The Rumpus for the link) shows what a vexed issue this. Many avoid the issue by avoiding Facebook. What this means for the current protest of course is that many of the people the students might like to know about their activities simply can’t get access to the site. Facebook’s walled garden prevents anyone without an account from looking in. I take two things away from this. That the current generation of students use Facebook as a matter of course and don’t imagine that anyone might not. And secondly, that Facebook has an extremely firm grip on the browsing habits of millions of well-educated, soon to be affluent web users. Once the distinction between open web and Facebook is gone–and it looks like it has for these students–the web as a free and open environment is at risk. As some of the commenters in the Chronicle thread note, joining Facebook eventually becomes unavoidable. I have asked the protest group to post the information openly online and have offered to do so for them. I’ll link to it from here if that happens. In the meantime, here’s the Facebook page, which I haven’t seen.